I need some help setting the crank pulse wheel settings for the 40-2-2 flywheel used in the Regina fuel system. 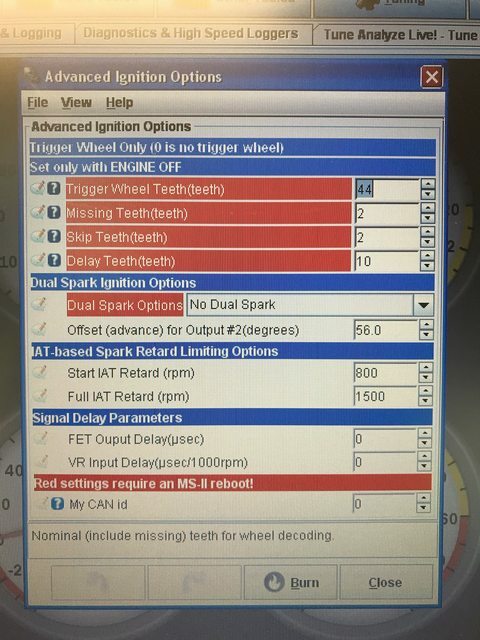 Find a copy of greenbook TP31397-1 Ignition and, I think, there's a picture of your Regina crank wheel on pg. 24. MicroSquirt may use slightly different nomenclature for the wheel: 44-2-2 "fourty-four minus 2 minus 2". You may need to search around http://msextra.com/forums/ if it doesn't behave for you -- support for some of the more uncommon wheels can be buggy/broken. Wouldn't it be easier to set it up via the Regina igniton box like the lh2.4 guys are doing? Ford Colonge V6 in the works. Can someone help me set this up for Regina? You may need to upgrade the software from the original B&G code to the MSextra code (see http://www.msextra.com/downloads/) -- I don't know if the original code supports wheels with two missing tooth sections. I’m really new to al of this. I’m running v2 microsquirt. So then I would have to use msextra software to tune? if it's a v2 micro, I think you have to have an external vr conditioner, right? anyway, regarding the firmware,software... when you upgrade to ms&se, tunerstudio will auto detect and download (if need be) the correct definitions for that, and then I suspect things will make a bit more sense. Ok I’ll try it. My old computer I use won’t connect to the internet and the usb to rs-232 adapter won’t work on my newer windows computer or Mac book. So I need to transfer it to a flash drive blah blah blah. Can you check what version of MicroSquirt you have? It should say something like "Microsquirt Engine Controller V3" or similar on the back of the plastic case. (You do have a plastic cased MicroSquirt, about the size of a pack of cards, and not a metal cased MegaSquirt, about the size of a paperback book?) The V3 microsquirt includes conditioning circuits for VR CPS sensors. 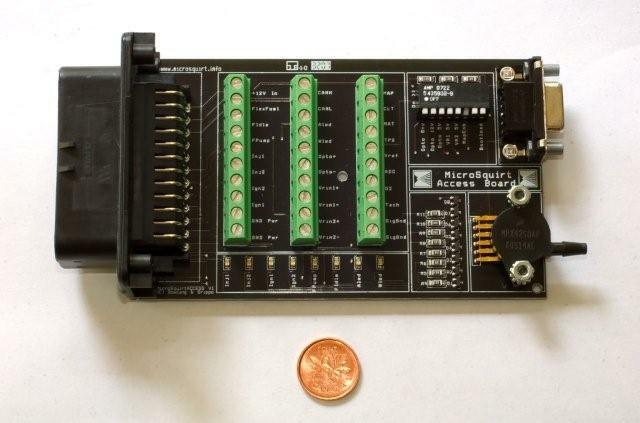 The original microsquirts only directly supported Hall type CPS sensors -- you need an add-on VR conditioner board to use a VR sensor, or an adapter bracket and a hall sensor (Mueller?). What's your engine and car? I have microsquirt v2 metal case. The car is a a 1990 740 Regina. I have made a plug and play harness and I know what all of the sensors should be calibrated too. I thought I could use the factory crank sensor. Well crap. This is frustrating. I don’t know anyone else running a stand alone. I just try to read and take. Let’s as much as possible. 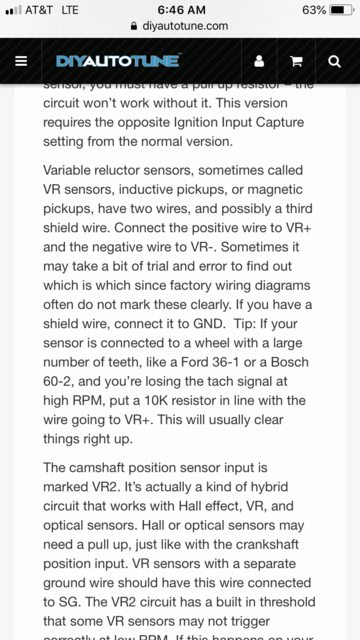 So I can’t just connect it to VR+ and VR- then ground the shielding wire? The original MicroSquirts used the same circuits as the MegaSquirts, but in a smaller package. Instead of the fussy adjustment pots for the crank conditioning circuits, MicroSquirt used fixed values. You might get lucky and have those fixed values work OK with your setup, but I doubt it. To try this, you'd connect CPS pin 1 or 2 (VR+ or VR-) to the MicroSquirt VRIN+ pin, the other CPS VR pin to ground, and the shield to ground. There's a chance that you'll have the polarity wrong and will have ignition wander. If so, swap which VR pin from the CPS goes to VRIN+. The old MicroSquirt docs, or maybe the experts here, might know which CPS pin (1 or 2) to use. Also try sending a PM to Mueller and see if he's the one who made adapter pieces to use a Hall sensor in the CPS sensor hole. I don't know how well they worked, but it would be one solution. Otherwise, JBperf (or maybe FreeEMSFred) have standalone VR conditioner boards. Awesome thank you very much for the clear explanation and help. I was reading this, this morning. I don’t know if that applies to me. I found some docs for the microsquirt V2 and yes, there is a dedicated VR- pin (it just connects to ground within the box), so you'll connect CPS pins 1 and 2 to microsquirt VRIN1+ and VRIN- (pins 32,33). You can connect CPS pin 3 shield to VRIN-, or to any other ground pin. I don't know whether CPS pin 1 goes to the + or -. It's probably the same as connecting to a MegaSquirt if you can find that. I'd try running your CPS as is with the MSextra code and see if it works. The V2 circuits may be OK with your Regina wheel, or they may have problems at higher RPM, like some of the other MegaSquirt/MicroSquirt circuits. If the regina flywheel doesn't work I think you could use a block mounted hall sensor distributor. 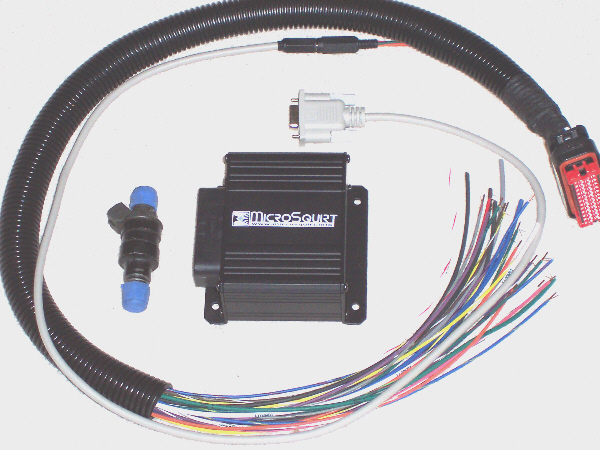 Can microsquirt send a low positive voltage to the coil pack with power stage? Btw I’m trying to use a Regina coil. First off, disconnect your injectors and your coil until you get a good tooth pattern while cranking. The polarity of the signal to the power stage is selected by the confusingly named Spark Output "Going High" or "Going Low" setting. If you use the wrong one, it may overheat your coil and will trigger at the wrong time. 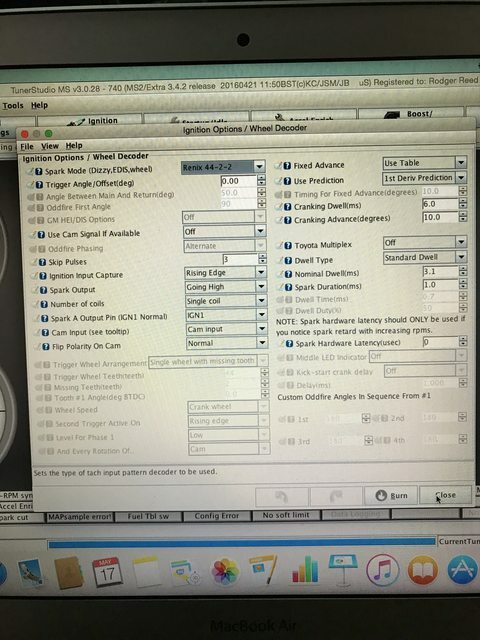 To check the crank VR sensor, you want to run a "Tooth Logger" view from Tuner Studio - see the MSextra Setting Up Guide for Megasquirt-2 (your MicroSquirt v2 is most similar to Megasquirt-2). If you get something, but still aren't getting rpm sync, post a picture. You can also test the fuel pump, injectors, ignition and idle valve separately - see the Output Test menus under the TunerStudio CAN-bus/Testmodes tab, and the Setting Up Guide. I looked at the schematics and I don't see any jumpers in the MicroSquirt v2. Unlike the MegaSquirt, you either wire up the Opto input or the VR input (not both) and the circuits will use whichever one is active (no jumper selection is involved). Does your MicroSquirt have some sort of plug-and-play adapter board, in addition to the main MicroSquirt board? If so, please post a picture showing any jumpers.